Sudipta Bardhan-Quallen begins The United States v. Jackie Robinson, "Long before anyone heard of Rosa Parks, a guy named Jack refused to move to the back of the bus. And like Rosa, jack made history, too." 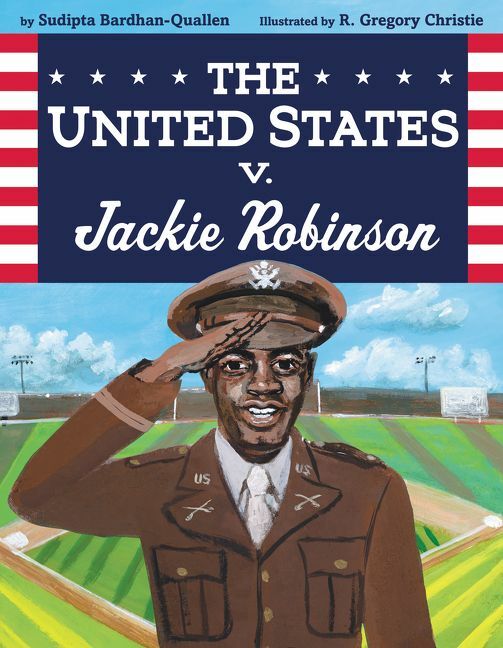 Adding yet another superlative picture book biography to the shelves, Bardhan-Quallen and illustrator R. Gregory Christie share the story of Jack Robinson and his fight against segregation and discrimination before he became the national hero, American icon and baseball star, Jackie Robinson. The United States v. Jackie Robinson begins with Jack's childhood in Pasadena, CA, where the Robinsons were the only black family on their street. 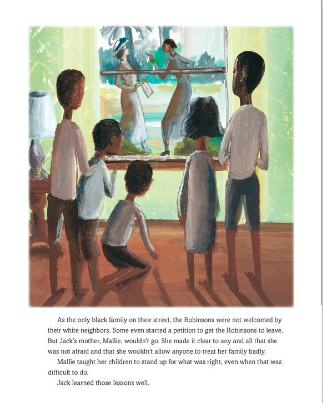 White neighbors even started a petition to get the Robinsons to leave, but Jack's mother, Mallie refused to leave, teaching her children to stand up for what was right, even when it was difficult to do. 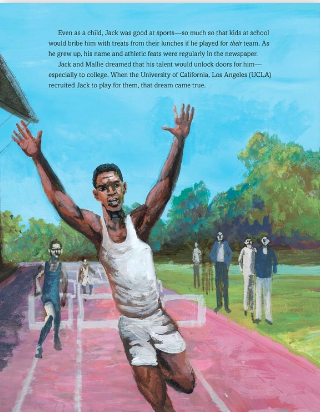 A natural athlete, Jack was recruited by UCLA, becoming the first person in the history of the college to earn varsity letters in four different sports. 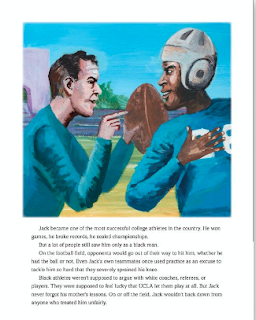 Joining the army after the attack on Pearl Harbor, Jack experienced segregation on a daily basis, alternately being told he could only play for the non-existent colored baseball team at Fort Riley and that he could be commanded to play for the football team. 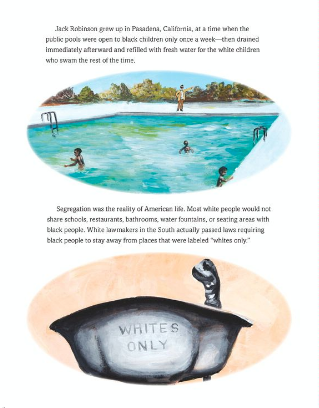 In 1944, the army issued an order forbidding segregation on military posts and Jack soon learned that just because the army gave an order didn't mean that everyone respected it. On July 6, 1944, Jack boarded a bus while stationed at Fort Hood and did not sit in the back. Jack was courtmartialed and listened as the prosecution witnesses took the stand and lied about Jack, painting the picture of a defiant, disrespectful soldier. When Jack's commanding officers took the stand, the truth emerged and Jack won, becoming one of the first black Americans to challenge a segregation law in court and win. The United States v. Jackie Robinson hooks readers with a name they are (hopefully) already familiar with, adding depth and layers to the fight for civil rights fought by Jackie Robinson and so many other's committed to equality. Back matter includes an author's note, a timeline and a bibliography.